Home » Health » What Is Deep Vein Thrombosis? Deep Vein Thrombosis or DVT or Deep Venous Thrombosis is a condition when blood clots occur in one or more deep veins. DVT generally occurs in the thighs or calves, but can also form in other parts of the body. Deep Vein Thrombosis can cause pain and swelling in the legs which can lead to serious complications of pulmonary embolism, which is a condition when blood clots enter the bloodstream and clog arteries in the lungs. Surgical procedure that anesthetizes the patient for 1 to 1.5 hours. Pelvic or leg surgery, such as pelvic replacement surgery. Long journey by car, train or plane, so that the limbs don't move much, especially traveling more than 4 hours. Disease or injury that causes the body to move in more than 3 days. For example, fractures or strokes. Installation of a central venous catheter (CVC). Lack of natural blood thinning proteins, such as protein S (protein S deficiency), protein C (protein C deficiency), antithrombin III (ATIII deficiency). High homocysteine ​​levels ( hyperhomocysteinemia ). Increased levels of fibrinogen or fibrinogen dysfunction (dysfibrinogenemia). The advantages of freezing factors VIII, IX and XI. Fibrinolysis system disorders, such as hypoplasminogenemia, dysplinogenemia and increased levels of plasminogen activator inhibitor (PAI-1). Consumption of hormone replacement therapy. Nephrotic syndrome (too much protein in urine). Use of drugs to treat cancer, such as thalidomide. Pain that gets worse when bending the legs. Swelling in one leg, especially in the calf. Cramps that usually start in the calf, especially at night. 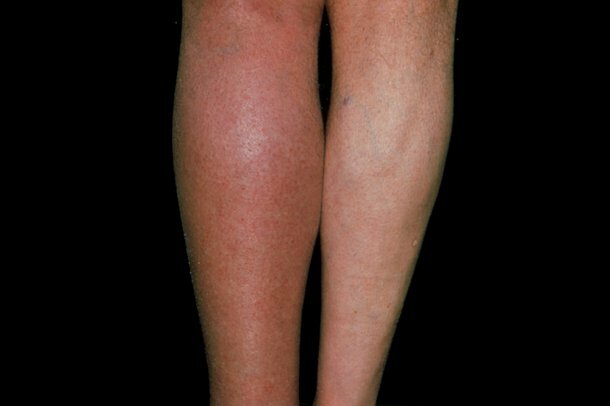 Discoloration of the feet becomes pale, red, or darker. D-Dimer test. This test is to detect blood clots that have broken down and enter the bloodstream. The more blood clots that have been broken down are found in the blood, the more likely there is blood clotting. Ultrasound This test is used to check blood flow, whether it is normal or there are obstacles due to blood clots. Venography. The test is carried out by injecting dye (contrast) on the patient's vein, then imaging with X-rays to determine where blood flow is blocked due to blood clots. A venography test is performed if D-Dimer and USG Doppler examinations cannot confirm DVT. Treatment for DVT patients is by giving anticoagulant medication. People consider anticoagulants to be blood-thinning drugs, but actually these drugs convert proteins in the blood to prevent blood clots from forming. This drug also functions to prevent blood clots from getting bigger and spread to the bloodstream. The type of anticoagulant medication commonly used to treat DVT is heparin and warfarin. The doctor will give heparin first, by injecting it down fat or through a vein. If patients prefer drugs in tablet form, warfarin can be given. But keep in mind, warfarin does not work immediately after consumption, so it needs to be given other therapies simultaneously. Patients can take anticoagulants 3-6 months to prevent blood clots from forming again. Warfarin is a drug that is often affected by food or other drugs at work, so patients need to do a blood test (INR) regularly to monitor blood clotting time, so that the dose of warfarin can be adjusted. Warfarin doses that are too low cannot prevent blood clots. Conversely, too high a dose of warfarin can cause the patient to bleed. Important to remember, warfarin is not recommended for pregnant women, because it can cause birth defects. Other anticoagulant drugs recommended for DVT patients are rivaroxaban, apixaban, dabigatran, and fondaparinux. If a large blood clot, at risk of developing pulmonary embolism, or a DVT arises in the arm, the doctor can provide thrombolytic medication. However, this procedure can make patients more at risk of developing cerebral hemorrhage. If anticoagulant medication is not allowed, the doctor will place a filter on the main vein ( vena cava ), which is located in the abdominal cavity. The filter serves to prevent blood clots from entering the lungs. Keep in mind, installing filters in the long term can cause DVT. The filter should be removed immediately after the risk of blood clots decreases. The patient can also use compression stockings below or above the knee to prevent swelling due to DVT. Although it cannot reduce DVT that has already occurred, the use of stockings can reduce the risk of developing new blood clots. The doctor will advise the patient to wear compression stockings every day. Foot exercise is simple by moving the back of your foot upward, and lifting the leg when you rest, so that the leg higher than the pelvis can help reduce swelling in the legs and prevent complications of DVT. People with DVT are at risk of developing pulmonary embolism , which is a blockage of arteries in the lungs due to blood clots that are released from the legs. Symptoms will not be felt or seen if the blood clots are small. But if the blood clots are large, the sufferer can feel chest pain and have difficulty breathing, even heart failure . Long-term DVT can also cause post-thrombosis syndrome (PTS), which is a condition when DVT causes damage to venous blood vessels so that blood flow in the area becomes worse. This situation results in skin discoloration and injury to the legs. If you want to have surgery and the patient regularly takes birth control pills or hormone replacement therapy, you need to stop the drug 4 weeks before surgery. Depending on other risk factors, doctors can also provide anticoagulant or compression stockings to prevent DVT due to surgical procedures. If you take a long journey that requires sitting for a long time, you can do simple foot movements such as bending your legs upward, or occasionally waking up from your seat to walk (if possible), and drinking lots of water to prevent dehydration. Eat food with balanced nutrition. 0 Response to "What Is Deep Vein Thrombosis?"